John Mair, or Major (c 1467-1550) lectured in Theology and was Principal of the University from 1518 until 1526. He wrote some of his most influential works during his stay in Glasgow, including the famous History of Greater Britain, England and Scotland. According to the historian Alexander Broadie, "Mair was undoubtedly at the centre of cultural life in Europe during the first half of the 16th century". Born near Haddington, Major was educated at the local grammar school and, about 1491, at the University of Cambridge. He studied and worked at several colleges in France, obtaining a Masters in Arts and a Doctorate in Theology, and began lecturing in Theology at the College de Sorbonne in Paris. In 1518 he returned to Scotland to become Principal of the University and he was also appointed Vicar of Dunlop and canon of the Chapel Royal in Stirling. 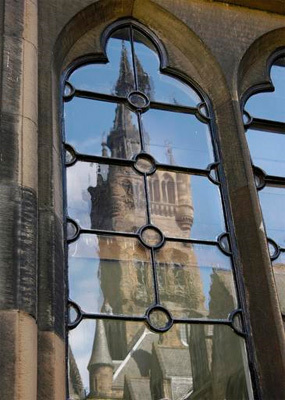 He left Glasgow in 1523 to teach in St Andrews, in Paris and then at the University of St Andrews once again, where he was Provost of St Salvator's College.